the cursor is blinking_: Extra-ordinar-E! I have been a PIXAR fan right from the Toy Story days. And in every next release, they have been raising the bar. Their movies are not just technically and artistically marvelous but, they have interesting stories to tell too, that too executed in a manner, even good old movie makers should feel ashamed. Finding Nemo was one such movie where they performed not only good, but the best in every department of movie making, and I believe it was the cherry on the cake. But, Wall-E takes it to a whole new level. Its the new cherry! A story of a small, inconsequential robot, which is probably the only survivor on a planet. He (yea, its a he, cause there's a she too :) ) keeps doing his routine work of picking garbage and making cubical bricks out of it, that is his directive, his goal in life. And he keeps doing that, for 700 years! But then something happens...and I'll stop there, I won't spoil a bit of it. What follows is an amazing story of quest for longing, love and spirit. Technically the film is top notch. Scenes of the desolated planet, the spaceship interiors are surreal. The amount of effort spent on the futuristic technology shown, in terms of robots, machines, their movements is tremendous. The USP of the film is however that, the creators pull off an engrossing tale, with very less dialogue. There is hardly any dialogue in the first half of the movie! It rivals the kind of movie making shown in 2001: A space odyssey with sound, image and actions conveying more than the dialogue. 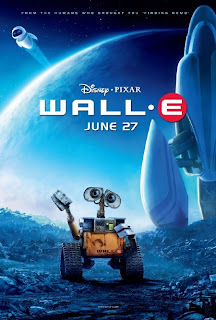 The first few minutes showing how Wall-E stays on a deserted planet, felt very much like in the old movie "Soldier" starring Kurt Russell, and the later with lots of small cute robots felt heavily inspired by "Robots" from Blue Sky Studios, the guys who made Ice age. But the movie, as a whole is superbly innovative and it has many of its "moments". Wall-E is truly extra-ordinar-E! Go watch! yeah, totally agree with you, fantastic movie. I even liked the opening part with the bunny and the magician. Indeed a very nicely made movie, a must watch !